A well-balanced Jasmine Pearl tea that is lightly scented with rich body. Made from tippy long tea buds. There are two types of jasmine green tea. Here are the pros and cons of each. If you want the highest quality for maximum health benefits, go for a Jasmine Needle such as the Golden Needle King. Made from young, tippy tea buds harvested in spring, she contains high concentration of antioxidants. If you want bigger bang for your bucks, or just want a delicious everyday beverage, the Jasmine Pearl tea can be excellent choice. There are a couple of things to be aware of. Many tea shops claim their tea is "tippy", but the reality is slightly more complicated. 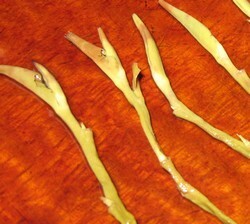 As you can see from the picture on the right, even a "tippy" jasmine such as this Phoenix Eyes have very long tea buds. This is because the plant stems have been included. Now, there is no conspiracy here. These plant stems are essential - otherwise you won't be able to roll the tea into beautiful little balls! Also, even plant stems also contain significant health benefits. Pearl-shaped tea has a small surface area and keep fresh longer. This Phoenix Eye AAA Grade is the highest grade Jasmine Pearl tea we have uncovered so far, and we do like her! Compared to the Golden Needle King, she is relatively lightly scented. Pleasant to drink and easy to like, her body is rich with a slight astringency. Durability is very high. On the right is a photo of the tea liquor for first, third and fifth infusion. The Moli Fengyan 2010 (AAA Grade) is good, and better than most you would buy at a grocery store in the U.S. indeed. However, it did not have the stronger aroma like the Moli Jinzhen (AAA Grade). At a few dollars more, I would recommend going with the Moli Jinzhen (AAA Grade) due to its wonderful sensory factor and incredible delicate sweet taste. It looks neat in the pearl shapes and still has an initial aroma before steeping thats fairly good. When steeped, it does not have too strong of an aroma, but is delicate and still there for enjoyment. I was able to steep it twice. However, the Moli Jinzhen (AAA Grade) I was able to steep up to four times with noticeable flavor retention. Either or, both are very good quality! I will branch out and try other teas from Tea2 (formerly Amazing Green Tea, and it truly is!). You have 2 of the best Jasmine teas I ever had and there is a lot of them on my shelf. I love this for a change of pace from other teas or when I running around a lot and come back to have a cup hours later. 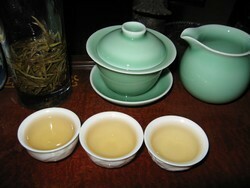 I brew now in a Gaiwan with 4-6 pearls using 90c in 80-100ml water and very short steepings of 10 seconds and up. Over-brewing gives off a bitter astringent taste. This can brew 8 cups easily maybe more if you extend the steeping time to minutes. The other ones were good, but I bet they are better right after harvest in the spring. Also it is a matter of taste preference. I just like the type of jasmine flavor of the one listed below. Thanks! This tea is the most similar to some I bought while in Beijing. That was when I first fell in love with it but didn't buy much choosing instead, to buy several kinds to try them. I also like the large blossom jasmine tea. Love this Jasmine, light delicate taste that is only toped buy your Jasmine Needle buy a bit. Taste stays with you for a long time and brews fine with quick infusions at first. Will definitely reorder this and the Needle version! Jasmine tea should be brewed the same way as the Dragon Well tea by infusing a small amount of leaves in high temperature water for as long as it takes.